I have an older Beretta AL-2 from the 70’s that’s a pretty nice shotgun and even with the plastic buttpad, absorbs the recoil quite well. I picked it up in a pawn shop for around $400 with no issues other than a small nick in the fore end. My only issue was that the original charging handle was a tiny sliver of sharp steel that you could barely get your pinkie finger on. 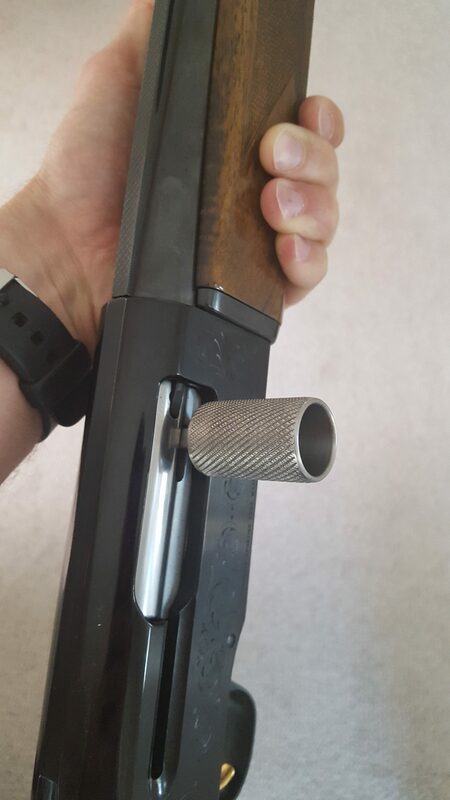 I was inspired by all the really cool aftermarket accessories that are out there for Benelli shotguns to get a nice, big, knobby handle. This is my second charging handle since a few years ago, my brother-in-law made one for me out of stainless steel. It works pretty great, but is very heavy and not knurled. A friend has access to a shop at his work and had a week with relatively few projects to work on and counted this as “cross-training time.” He drew up an idea on CAD and then made it out of 1.25″ diameter Grade 23 Titanium. Changing the charging handle originally to the much heavier Stainless Steel didn’t impact the gun’s cycling, so I wasn’t expecting that switching to this lighter one would make much of a difference. The feel of it is great: the knurling is pronounced enough to get a good grip, but not so deep to be painful or take any skin off. The gun cycles just fine and you really don’t need to be careful when trying to pull it back: just grip it rip it!